At the end of last year, a book was released that had me page turning faster than the bionic woman on steroids. 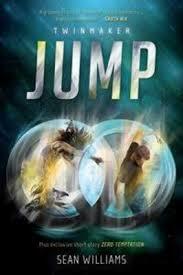 This book was “Jump” by Sean Williams, book one in the “Twinmaker” series. Set in our future world where the characters are using a teleportation device called a d-mat. The teen generation are consuming this technology like candy without a thought to it’s possible consequences until the protagonist, Clare’s, world is spun out of control when her friend Libby’s life is threatened. Clare’s life is turned into a rollercoaster ride and this is where the book shines, Williams knows how to move the novel along at a gripping pace. We see Clare’s character grow as her eyes are opened to a larger more sinister world than her previous carefree life. The book plunges headlong into all the teen dramas without moral judgment. It delves into the dilemmas of friendship, loyalty and, superficiality and comments on the future use of technology and social media. I felt at times that Sean Williams lacked subtly in exploring these themes, I like my themes whispered not screamed, but his twisting and suspenseful plot kept me intrigued to the very end. There are two more books in the series; I do hope we see more character development, as I need to care. I do like Clare, but everyone else is slightly superficial.